I just can’t ignore this historical event. 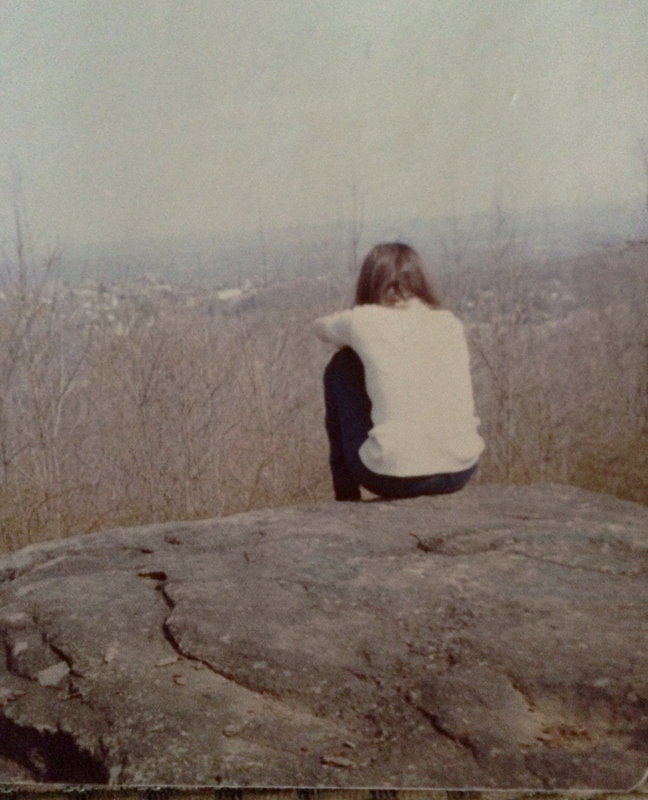 I spent one year sharing memories of my life—some as silly as the admission that I once brushed my teeth with Bengay pain relief cream or the fact that I spent many summer days trying to catch birds with a salt shaker. 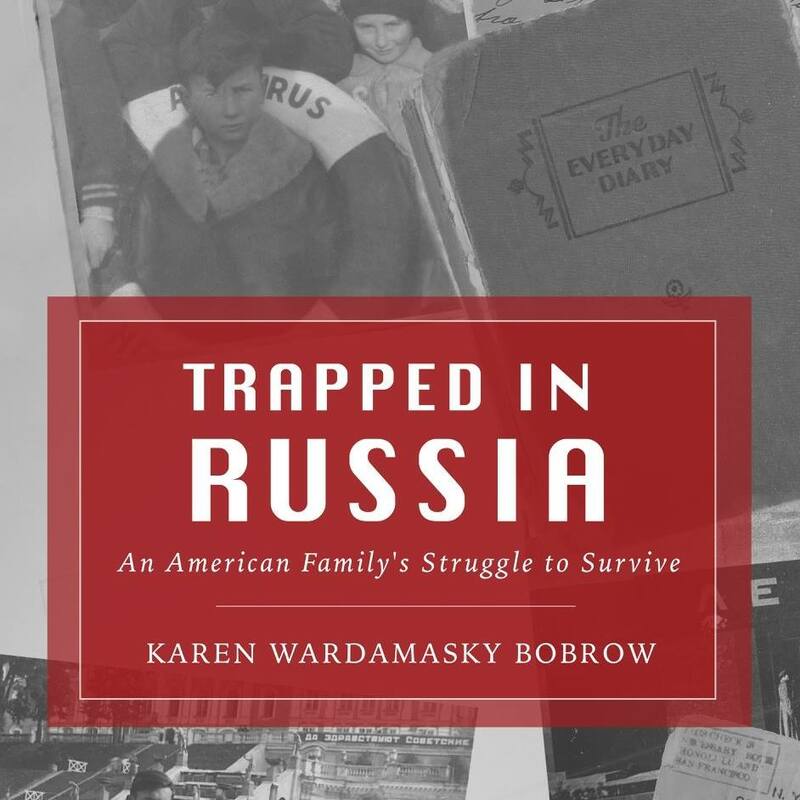 I blogged for three years about Grandpa’s very unusual childhood growing up in the Soviet Union. This week it’s time to step back and be happy for the historical moment unfolding at our feet. My grandmother—Grandma’s mother—was finally able to cast a vote for president when she was twenty-five years old—in 1920—which was when my father was not yet walking. 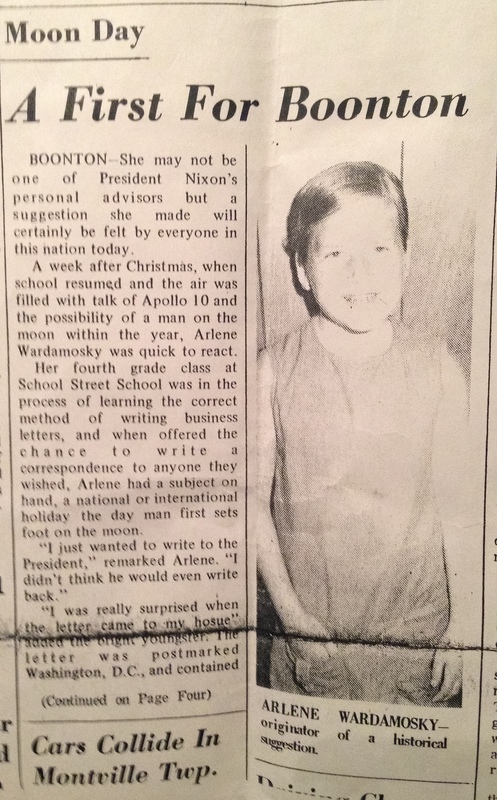 Among Grandpa’s newspapers I found a newspaper published when I was about to enter eighth grade. 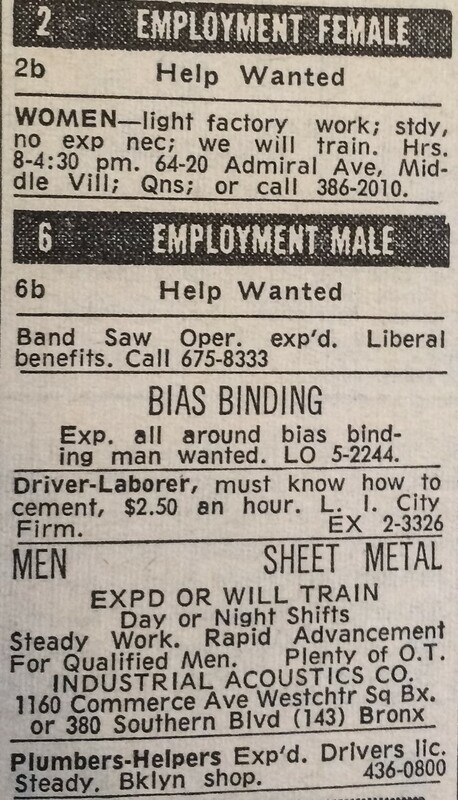 A careful look at the employment ads shows that they were separated into what someone determined to be “male/female jobs.” These were the days when women worked as secretaries and men always ran the show. When I went to college in 1973, my plan was to be a math teacher. Perhaps an engineering career would have been a better fit, but it just never occurred to me. No one suggested it; no one planted the idea in my mind because engineering was typically a men’s field at the time. Now I have lived to see our first black president, and this week, I am watching as the first woman has been nominated to run for President of the United States. While I understand the dislike of Hillary Clinton by some, I do not understand why all women cannot step back and think about how far we have come since that election in 1920 when my grandmother—and all women—were finally allowed to vote. Now my granddaughters can truly grow up believing that they can be anything. My dream is that for just a moment, all women can put aside politics and be excited for how far we have come. I would hope that if Grandpa was alive today, as the father of three daughters and a grandfather of seven granddaughters, he could appreciate that moment as well. Why not for a least one moment? Dad and I checked out the new Kroger Marketplace on opening day, and I must say, it was definitely not a Shrek. It was the most impressive supermarket we have ever been to, and I was particularly excited by the wine and cheese department. I was going to finally treat myself to my first royalty-check bottle of wine, but I need to do some research first. If I am going to spend more than $10 on a bottle of the fruit of the vine, I want the purchase to be memorable. When we all joined him at his hotel, he was eager to bring us to his new favorite restaurant, which I believe was conveniently located across the street from his hotel. I cannot deny that their ribs were delectable, and their barbecue turkey was tasty as well. As you remember, we liked it so much that when his job in Memphis was done, we would periodically have Corky’s delivered to our house in New Jersey. It would be shipped FedEx, arriving packed in dry ice, and as kids, you not only had a meal to eat but the ice to entertain yourselves. I am not certain who first came up with the idea of renaming the FedEx truck, but whenever a shipment of Corky’s would arrive, you would shout out, “It’s the Corky’s truck.” To this day, when I get a delivery from that truck with the familiar arrow, I think first of those ribs from Tennessee. I guess we will have to try them again someday and see if we still feel the same. When I die, many, many years from now, at least one of you—maybe all of you—will speak at my memorial party. (Yes, party and not service!) I know I have been annoyingly providing suggestions for my obituary (lots of details but I want it to paint a picture of me too), the music (Barry Manilow among others), and thoughts on the dress code (nothing dreary). Dad and I were watching a show on TV the other night—Grace and Frankie with Jane Fonda and Lily Tomlin. I particularly love Lily’s character, Frankie. The particular episode which precipitated this story was called “The Road Trip.” Frankie convinced Grace to go on a road trip in search of Grace’s old love, who Frankie was able to locate using her superior stalking skills. Frankie said something that made me jump up and run to my desk so I could write what she said down, knowing I would forget it in the morning. It was so me—a description which I told Dad should definitely be used in my eulogy. “I am an amateur sleuth with limited self-control and a computer.” Come one, girls. You all know this would make a great opening line at my eulogy or eightieth birthday roast. Does it not sum up me during this part of my life? Think of all the people I have been able to find—both living and dead. Remember how I took the yearbook I found in the attic, which was from the year Dad graduated, and set out to find its owner? It did not belong to Dad. I found the father of the owner and even spoke to him on the telephone. He told me where she was currently living, but mentioned he had not spoken to her in years. I hung up the phone feeling happy that I had located her, yet at the same time, quite sad to hear an elderly father share this information with me, a stranger. So I took a photo of the yearbook and her diploma (which was tucked carefully inside) and mailed it to her. I got no response and concluded she did not wish to be found. Maybe she is in Witness Protection? You live in a world where getting information at the snap of a finger is normal. It is so much more difficult to get lost because we have our GPS devices in our cars or maps on our telephones. Yet I know you are old enough to remember the days before our many devices directed us towards our destinations. Today, I would like to discuss our trip to Memphis in 1995—specifically, the trip to the movies. Dad was working there for about a year, and we had driven down to visit him and see the sights. One day, you all wanted to go to the movies. I’m not sure which one. It really doesn’t matter, but still, I Googled movies out during that summer and up popped “Casper” starring Christina Ricci. That must be the one. Anyway, back to my story. We set off in our green minivan from our hotel, headed in the direction of the theater. Obviously, I was not familiar with the area one bit and I am directionally challenged. I am the first to admit it now to Dad. I cannot hide the fact after so many years together. Iit was just a short drive away, and I had already traveled so far with little trouble (except driving around Washington DC, but that’s another story) from New Jersey to Tennessee so I thought this was going to be easy peasy. I was wrong! We were driving merrily along the highway when we came to a sign—the proverbial fork in the road. My choice was to head e1ither toward Jackson, Mississippi or St. Louis, Missouri. There was no indication which direction to choose when looking for the movie theater. I panicked and chose the wrong direction which resulted in us arriving at the theater two hours late. So we saw the next show, and I somehow figured out how to drive directly back to the hotel. I probably asked, which is why, to this day, I say it took two hours to drive to the theater and fifteen minutes for the return trip.